An explanatory note to the document says that currently there are mass violations of military discipline, in particular, desertion from units and drinking alcohol, as well failure to execute commanders’ orders. In late January, a new Ukrainian military draft for 2015 came into effect. This one is the fourth wave of mobilization since Kiev launched a military operation against militias in eastern Ukraine in April 2014. The Ukrainian president’s adviser, Yury Biryukov, cited statistics, showing that desertion surprisingly was primarily a problem in western Ukraine, traditionally seen as a hotbed of anti-Russian sentiment. The Ukrainian president went as far as signing a decree on additional measures to ensure a successful draft in 2015. A major provision is temporary restriction on leaving the country for men eligible for military service. 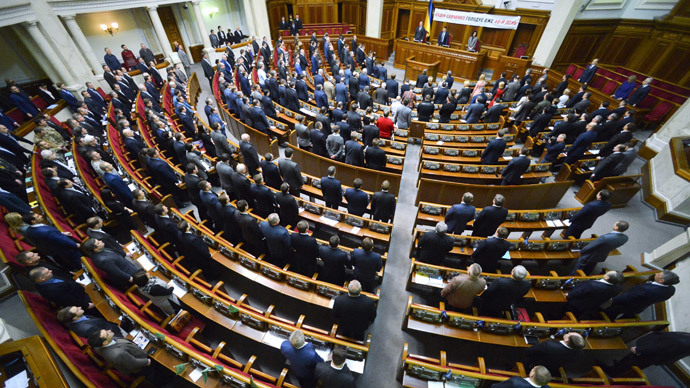 “The Verkhovna Rada [Ukraine parliament] has authorized the shooting of army deserters. By doing so they are risking shooting the whole army: people don’t want to participate in a bloody venture,” said the head of Russia’s Lower House of Parliament Committee for relations with the CIS bloc, Leonid Slutsky, on his Twitter. Kiev began a military assault on eastern Ukraine's Donetsk and Lugansk regions in April 2014, after they refused to recognize the country’s new, coup-imposed authorities. Following a period of calm and hopes that the Minsk negotiations conducted in September 2014 were bearing fruit, Kiev launched a new assault on the militia-held areas on January 18. Since then, eastern Ukraine has suffered constant shelling. Among the latest incidents, a hospital in Donetsk was hit on Wednesday. Local authorities said more than 15 people were feared dead in the attack. According to UN estimates, over 5,000 people have died since the conflict started.